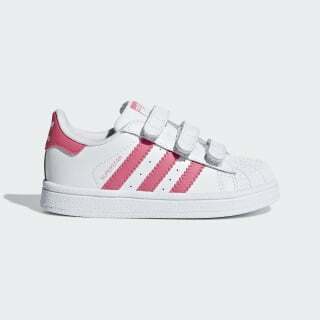 Classic adidas Superstar trainers for the littlest members of the family. Inspired by the game-changing '70s basketball trainer, these infants' shoes show off iconic adidas style. This version of the adidas Superstar shoe features a leather upper with hook-and-loop closures that make it easy to slip on or off wiggly feet. The classic shell toe and rubber cupsole complete the heritage look.